Get ready to nominate the most important HigherEd AV/IT technology spaces and solutions. This program is now OPEN. NewBay Media editors recognize that technology supports specific pedagogies, campus culture and helps project school pride, not the other way around. The editors have created the first of its kind, “AV/IT College Standings,” to help colleges and universities be recognized and ranked for its commitment to education first, while supporting student outcomes. From our many interviews and case studies we’ve written, we understand that technology can be a large investment, but can also be a helpful recruiting tool. The “NewBay AV/IT College Standings 2017” is the first and only AV/IT technology ratings for colleges and universities to provide prospective students and parents to use during their evaluation process. Help your school be recognized for its forward-thinking technology. Digital natives are the workforce of the future; they are looking for a college experience that will provide hands-on training on the latest tools. For decision-makers looking to get a technology approved for the upcoming budget, showing what the competition is doing can help sway minds. Just saying. Nada. There is no cost to submit nominations—for anyone. From active learning classrooms, collaboration solutions, interactive digital solutions, student engagement technologies, immersive/experiential environments, sports locker rooms and stadiums to new building integration—you’ll see from the categories listed below that we think we’ve got the bases covered. Three submissions allowed (see below for details). The space/environment and/or technology solution must have been completed and in use during the 2015/2016 school year. This is an important ranking system, and we take it seriously. To ensure cousins, aunts and uncles are not submitting nominations and stuffing the ballots, we need to insist that your real work information is provided. PLUS, the highest rankings will have additional interviews done for case studies, so we need real information. Give credit where its due (and for potential follow up interviews), you must provide contact information for the main AV/IT person within the college/university. This will be the person who also gives permission for submissions from outside the university (i.e. consultants, manufactures, etc.). We also request contact info for any of the following teams that were involved: Technology Consultant, Architectural Designer, AV/IT Integrator—because everyone should share in the spotlight. Everyone will receive an email with the results. ► Available in December—get inspired! Part 1: Inaugural AV/IT College Standings Guide. Editors show inspiring case studies, insightful features, and tips from expert judges on how to make your nomination stand out. ► NewBay AV/IT College Standings 2017 announced in March. Digital edition to follow with case studies and details on each ranking—just in time for prospective parents and students to plan their college tours. 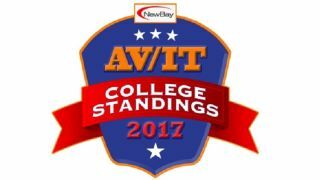 ► Colleges and universities among the standings can use the NewBay AV/IT College Standings 2017 logo to promote your school—anywhere you want. Download the digital edition, send a link, send emails, shout it on social media! Your college/university has made it into these important rankings. ► Consultants, architects, integrators, and manufacturers with a submitted nomination among the standings can use the NewBay AV/IT College Standings 2017 logo. Download the digital edition, send a link, send emails, shout it on social media, and more! Your installation has made it into these important rankings. Voting Public: Once submissions are closed, submissions will be made public for voting. The collective audience of NewBay Media AV/IT publications will receive an email to vote on the one nomination they feel is most worthy. The combined audience is more than 2 million individuals from colleges and universities, consultants, architects, integrators and manufacturers. Add social media shares to peers, and the number of voters is beyond huge. Again keeping it real: In order to vote, a real name, affiliation and email will be required. One vote per person. No cousins allowed! The name will NOT be associated with the vote cast. Final Judging: NewBay Media editors and an independent panel of AV/IT industry experts will help break ties, and make decisions if a nomination would be better served in a different category. The top 15 in each category will make it into the “NewBay AV/IT College Standings 2017” released in March 2017. Three, with one exception: We recognize that colleges and universities can have multiple schools, each with their own staff and budget. In this case, each school can submit up to three nominations. Consultants, architects, integrators, and manufactures can submit up to three nominations. (Not three per category or grouping—three submissions—period). Sometimes a specific technology can make a difference for one aspect of a campus or classroom which is why we are also providing the following categories. The solution must be tied to a specific environment or application in use at a specific college/university. Same rules apply as above. These categories are not meant for product write-ups. Upload up to five high resolution photographs of the space/environment described. IMPORTANT:By uploading photos, you guarantee you have full rights to submit this photography for publication. Do not upload any photographs you do not have full legal rights to submit for publication. If there are people in the photographs, you will have ensured you have their permission. Content displayed on screens cannot be copyrighted (e.g. no Hollywood movies, or major league sports teams). TIPS: Photographs help voters and judges visualize–make sure you show your best! Remember this is about the environment then the technology. Submit photos of overall space described. Technology shots help too if it helps illustrate your point. Make sure you have the photo credit needed! MUST: Main AV/IT contact at college/university (also the person that has approved outside contractors or manufacturers to submit on their behalf).